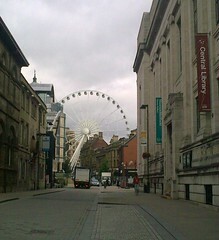 Sheffield now has a wheel, or an eye, or something else round; perhaps a sphincter of some sort. But in any case we have one and I really have no idea why. My adopted city has many things going for it, hence me having lived here for so long and one of those is it isn't a tourist destination, in fact it is barely a destination city at all. There will be a chunk of people during the nicer weather month who will base themselves here for doing exciting things in the surrounding area and I expect that some folk swing by on tours of the grand old cities of the north but you don't find the place knee deep in grockles. Various people are doing their best to attract visitors with festivals like Cliffhanger and Tram Lines but they are localised in appeal and duration (and in some cases location). So I don't think there is much in the way of passing trade so to speak. As for the locals, I have a feeling that once all the grannies and separated parents on access days have taken their charges on then that trade will dry up as well. People round here really want value for their hard earned pound and I can't see them seeing this 'attraction' as delivering that. It isn't tall enough to save you much of a walk to the various pretty buildings you will see from it in the city centre (there are some) and no-one really spends their day wondering what the roof of orchard square looks like. So given you can get better views of the city from a much cheaper bus ride or an entirely free walk, I imagine people will do that instead. Leave the gimmicks to the touristy places where they will be appreciated. On that subject this like many blogs has an underdeveloped Sphincter of Oddi and lets in too much bile. I recommend popping up to the Cholera Monument. Stoke put one up in the new year and took it back down a few weeks ago. Similar reasons, I expect - there wasn't anything to see from it and it wasn't cheap fun. I can't wait to go on it and think it is a really great thing for Sheffield to have. You are a misery and a killjoy. I have tried it. It is good. Plus it looks great. It is a fine, if temporary, addition to Sheffields otherwise bland skyline. Who exactly is it hurting?